Does apologetic method matter? Helmut Thielicke argues that the method should conform to its own message. He thus rejects traditional apologetic methodologies beholden to supposedly neutral scientific and philosophical paradigms. 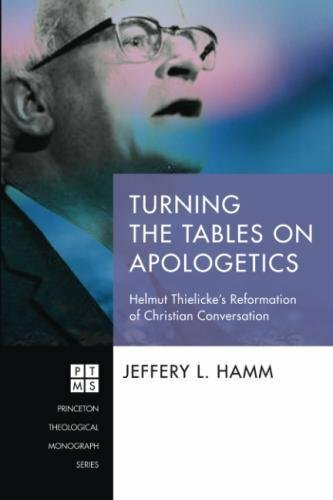 Seeking to reform Christian conversation, Thielicke discovers a lost way of persuasion, that is, the table-turning approach found in Christ's conversations. Whenever Jesus is questioned, he seldom answers directly. For he refuses to allow the conversation to be framed by an autonomous mindset, and instead responds with a counterquestion. Christ's style of persuasion--as the controller of the question--subverts his hearers' presuppositions and challenges their unbelief. This approach is the reverse of the defensive, answer-giving mode of traditional apologetics. In view of renewing Christ's method, Thielicke insists that the task of apologetics is "something which is always on the offensive and, far from giving ready-made answers to the doubtful questions of men, turns the tables by putting questions on its own account--aggressive, violent, radical questions--and striking straight to the hearts of men." Christian conversation must integrate Christ's method with his message in order to advocate the message itself. For it is not the world that questions Christ, but rather Christ questions the world. If you have any questions about this product by Pickwick Publications, contact us by completing and submitting the form below. If you are looking for a specif part number, please include it with your message.